As much as I’ve traveled in the last ten years I can admit that very little of it has been in business or first class. And, never in my life have I had the opportunity to experience a lay-flat seat flight experience. Which is why I was so excited to hear about JetBlue’s new Mint service between Seattle and the east coast. I partnered with them on my recent trip to Barbados to give their premium class JetBlue Mint service a try and share the experience with all of you! What is JetBlue Mint Service? JetBlue Mint is a premium class of service that starts at the airport and goes through to your seat at the front of the plane. Essentially it’s a first-class experience, but surprisingly without the first-class price tag. It is considered a business class experience amongst frequent flyers. It debuted in 2014 from LA to JFK, and just this year they started their cross-country Seattle routes. The Mint service grants you an exclusive check-in line at ticketing, ‘Even More Speed’ status for entry into expedited security lines (at certain airports), early boarding, free checked bags, a premium-class flight experience, and first-up delivery of your checked bags. While on board you’ll also be treated to helpful and personal assistance from the Mint flight attendant(s). I found on each of my flights that my Mint attendants were very kind and professional. And, I highly recommend you say ‘YES’ to the specialty refreshMint drink when you board. It’s like a limeaid with mint and you can choose whether to add vodka. Even with all the other perks, the JetBlue Mint seats are the reason to fly Mint. Very few other airlines offer the chance to completely lay down to sleep on a cross-country flight. If you’re headed across the country for a red-eye flight, getting a good five hours of sleep could be very useful. But even if you’re not planning on sleeping, the seats have a lot to offer for creating a comfortable flight experience. 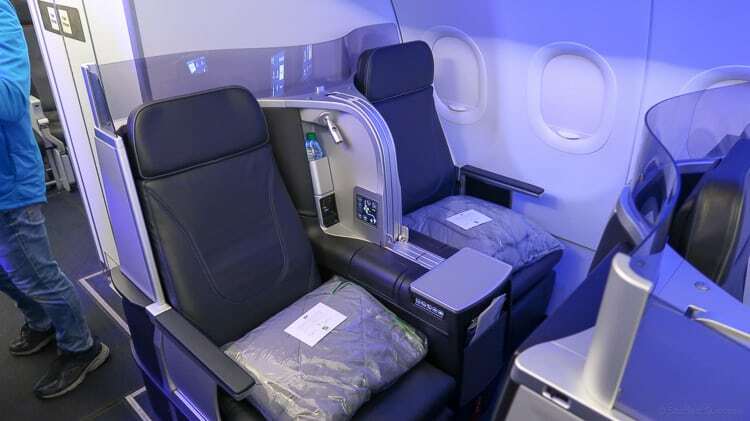 JetBlue Mint Seats in two-seat configuration. Each Mint seat has a large 15″ entertainment touchscreen which allows you to watch a selection of movies and stream live DIRECTV. You also get free wi-fi, a JetBlue feature available to everyone, as well as dual 110v and USB power ports at your seat. The seats also have a few spaces for storing devices and cords. You’re also given a cozy blanket and pillow that I honestly considered taking with me off the flight. I wonder if that would have been allowed! JetBlue Mint entertainment screens at seats. The Mint seats are equipped with an electronic seat control that allows you to adjust your back and leg sections of the seat. I found it wasn’t easy to find a great “lounging” seat configuration to watch a movie, but absolutely loved the lay-flat seat arrangement for sleeping. I’m 5’9″ and had ample room for stretching out so my guess would be that a 6′ tall person could comfortably stretch out end-to-end in the seats. There is a massage/vibration option for the seat but I was unable to really feel this at all in either of the two seats I flew in, so feel it’s a miss on mechanics. Lay-flat seats on JetBlue Mint. The seating configuration for JetBlue Mint offers 16 Mint seats. There are three rows of 12 seats in a 2-2 configuration. The remaining four seats for Mint are suites that are alone as 1-1 configurations. I flew Mint on two routes and got to experience both layouts. Of course, the Mint suite is the best if you’re a solo traveler. But with only four of those on a flight, you need to be booking early to have a shot at one. Each suite seat has a large ledge next to the windows, you get two, which is great for sitting bags or books on for added space. The suites also have individual doors that slide shut to allow you more privacy and seclusion. It’s important for you to know that you cannot have a carry-on at your seat in Mint. It has to be put overhead for takeoff and landing, which the flight attendants are able to help you with. If you’re sitting in one of the two-seat configurations, I found it difficult to find a place to sit my backpack during the flight, so had to just unpack what I needed and store it at my seat. Suite seat on JetBlue Mint. Beyond the seats, JetBlue has focused on food to be an enticement for flying Mint. They offer special seasonal menus that have been created in partnership with local businesses like the NYC restaurant, Saxon + Parole, and Seattle’s own, Molly Moon ice cream. Mint passengers will have a menu at their seat that has a set appetizer and dessert and allows guests to choose three small main options from a list of five. Each of the individual servings is small so having three small choices allows you to create a meal better fitting to your palate. Those on a red-eye flight do need to be prepared for a different dining experience than the standard Mint experience. When I flew the red-eye from Seattle to JFK I was not given the opportunity to choose from the menu, instead, we were all served the same dishes. Most of us slept for the full flight and had a breakfast bag to go waiting at our seat on arrival. The breakfast bags contained a sweetened bagel, Milk Bar cookie, and pressed juice. The flight attendant will ask at departure if you want to be woken for breakfast, which allows you to get coffee and orange juice along with your breakfast bag. A Hayward & Hopper amenity kit will be provided for the flight. These are created with custom fabrics and make great storage bags for travel. It seems based on other reviews I’ve seen that the amenity kits get changed out occasionally. My amenity kit contained an eye mask, socks, a toothbrush & toothpaste, earplugs, a lens cloth, and a Hudson Made care kit with hand lotion, facial mist, and lip balm. You can also request to borrow a pair of Grado Labs SR60e headphones for the flight. How Much Does JetBlue Mint Cost? While Mint is a splurge, it’s not unattainable. With some Seattle to NYC flights going for $1,000 or more for first class one way, seeing JetBlue Mint come in at $599 one way is quite the deal. Especially since the Mint service and experience is probably the best domestic premium class service you’ll find. I want to do it again! I can honestly say that JetBlue Mint is an amazing experience and worth the splurge if you can swing it. Again, be sure to book early if you’re hoping to snag one of those four suite seats. And, don’t forget to sign up for JetBlue’s TrueBlue points program. My review of the JetBlue Mint flight travel experience.